I read an opinion in the RCI catalogue and it was a bit nit picking but when we got to the Beverly Hills Hotel in Tenerife it was spotless. We were given a very nice welcome from the desk staff who were nicely dressed and smiling. They called the bellboy to carry our bags for us up to the top floor, unfortunately, I have an arthritic ankle and I told the bellboy I would have to ask the desk if I could be accommodated lower down. I hobbled down to the desk and explained the problem, the clerk just handed me another key and the bellboy showed me the room which was on the same level as the foyer, then he went dashing off and brought our bags from the top floor down to our new rooms. On the way back (with the key from upstairs) he told a pool attendant that I had a very sore ankle, he came to our rooms said he would be back. True to his word he came back with a first aid kit, and strapped up my ankle and for me to find a chemist. After the medical treatment Rosie and I looked around the rooms. To start with, there was not so much as a speck of dust anywhere - spotless. The bed was beautifully made, even the knives forks and spoons were all in their proper place, everywhere was spotless and I hope the people who said the rooms were not very clean must have brought any dirt in with them. The shuttle bus was a great help and Sarah she was as bright as a button big smiles when we got on the bus and the same when we got off. Just about everyone could not be faulted. I have run out of nice things to say about the hotel and the people who work there. To anyone who reads this comment and is thinking of booking a hotel in Tenerife they could do no better than the Beverly Hills Hotel seemingly we will have to wait four years before we can go back again. The Beverley Hills Heights Apartments were very impressive and we had a bathroom each. The maids were always cleaning and changing sheets and towels and were polite and friendly. What I really missed was a welcome meeting to tell us about the trips and recomendations. At least the kind reception staff were able to help us with our trips. The place seemed strangely deserted at times and on our last day in the plaza bar I smelt the smell of drains. We ate at the Hollywood Mirage one day, which was more impressive generally. We never met any other holidaymakers for a chat, like you do with a package holiday. No one spoke while waiting for the bus, it was a bit disconcerting. But all in all it was a good experience apart from the sickness bug my son and I suffered suddenley on day 6. I`ve never felt so ill, no one seemed bothered to report this, perhaps things like this are best not spoken about, but in the interests of public health these things should be investigated. Arrived just after new year, had been up since 4am so was very tired when arrived. Was told before going that RCI would provide private transport from airport to hotel, didnt happen! Was on a coach waiting for 45minutes before last airport car park. When arrived at hotel was told our room wouldnt be ready for at least 2 and a half hours, couldnt even change. So sat around pool bar til room was ready. Room wasnt too bad, although was 6people sharing so had 2people upstairs, but had to get maintenance out to room as door had been locked from inside. Mself and sister had to sleep in the living room and was told would be pull out bed, wasnt however and had to try share very uncomfortable bedding. Bar in hotel shut at 6pm but bar staff were closing up by 5:15pm. After that had to go to other hotels if wanted a drink. No entertainment. Sitting on the balcony at night all could hear was loud music and shouting coming from other rooms and smashing of things in their rooms, on more than one occation. Best part eventually came when were told we could chage hotel if wanted.....wouldnt recommend. 2bed 2bath apartment sleeping 6. We booked via RCI points system [timeshare]. The apartment was spotlessly clean and considering it was over 20 years old in pretty good condition. Full fitted out if you really wanted to cook! 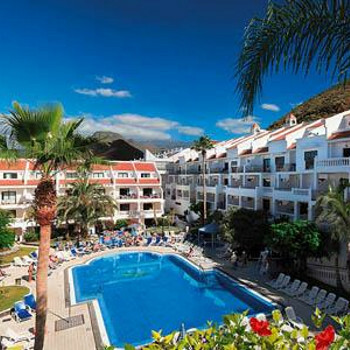 We had 2 balconies, one from the main living room overlooking Los Cristianos and the sea and one from the master bedroom at the rear overlooking the pool. The pool was well supervised and even at half term we managed to always get a lounger and the life guard would bring umbrellas if it got too hot. Beverley Hills Heights is part of a complex [Beverley Hills Club and Hollywood Mirage] and of the 3 is the quietest with the pool and pool bar closing around 6pm. We wanted peace and quiet so this was ideal for us. The other two complexes are very close by if you wanted a bit more night life or entertainment. We found reception to be helpful and welcoming, our room was ready on our arrival at 3pm although officially it is 5pm. If the hilly surroundings are a problem, there is a courtesy bus down to the town. We managed the hill and lived to tell the tale! Both me and my mum have health issues and were concerned that we might have struggled with the location but overall we coped very well. If walking is really an issue then there are supermarkets very close by, along with a few restaurants. However we found the close restaurants to be a bit lack lustre in quality and service, but venturing only a short walk down the hill were some better alternatives in our opinion. Beautiful place lovely apartments and great entertainment or the kids in the bar. Rooms clean and tidy and very home from home. Adult entertainment was on the poor side, cockney geezer with brandy every night calling bingo, and does a turn which is not at all impressive. Bee Gees? well surely it can't get any worse! The only good night we remember is when all the audience participated in the beetles night, dressing up and getting involved, that was excellent, should do more of those type stuff! Pool was freezing and gave you upset stomach and the staff are just not interested in making it warmer! The pool is supposed to be heated after all! get this fixed please! A few baby cockroaches under the sink unit in bathroom on our return back to the apartment every night! urggh! apart from that we all had a fantastic time! We have stayed at this complex on many occasions and would recommend to anyone. A little out of the way but does have a courtesy bus running until 6 in a evening. If you want that little extra then stay at the Hollywood mirage, very nice. Clean, well kept and the rooms have all you need. It is a time share resort and so people with clipboards always walking around. Never approached us - although we were on a timeshare exchange. The resort allows you to use the facilities of the Beverley Hills Club and Hollywood Mirage all set on a very steep hill. Do not go if you can't handle steps or have a buggy. The room was basic by timeshare standards and you cannot control your own air conditioning which was a huge issue for us. Entertainment was 'British', all UK visitors and based at that market. Black Lace performed one night !! That says a lot. Other shows at the Mirage were much better quality and more to our taste. The beach is ok not very clean, lots of broken glass around. IT is a bus ride away which was quite annoying. There is nothing about this resort which would make me want to visit it again - although my holiday was good! !